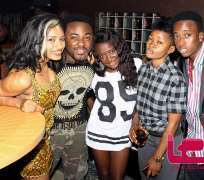 2face, Tonto Dike, Jimmy Jatt and others groove at Lee Celebrities' Party. On Saturday, October 26, 2013, it was a night of undiluted groove and fun as some Nigerian celebrities gathered at Swanky's Alibi Lush Mall, located at Lekki Phase 1, Lagos, for the Lee's Celebrity Monthly Birthday Party. The party was for the September and October edition and it turned out to be a very successful one. The hosts of the event, the eclectic Shine OAP Cool FM Lagos and the humorous Omobaba did a good job in giving the show a class. It was a night of partying like never before. Hypertek boss,Tuface, talented actress,Tonto Dikeh, Adams Ibrahim of Soundcity, Splash and many more came out to celebrate with the celebrants.